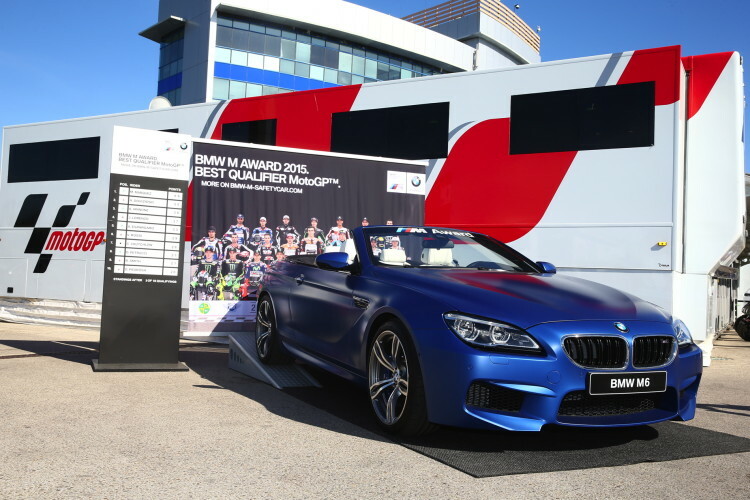 BMW M Division, partner of MotoGP organiser Dorna Sports, presented the next highlight in its MotoGP involvement at the Spanish Grand Prix in Jerez de la Frontera (ES) today: the car to be presented to the winner of the coveted BMW M Award. Since 2003, the rider with the best qualifying results come the end of the season has been rewarded with an exclusive, individually customised BMW M car. 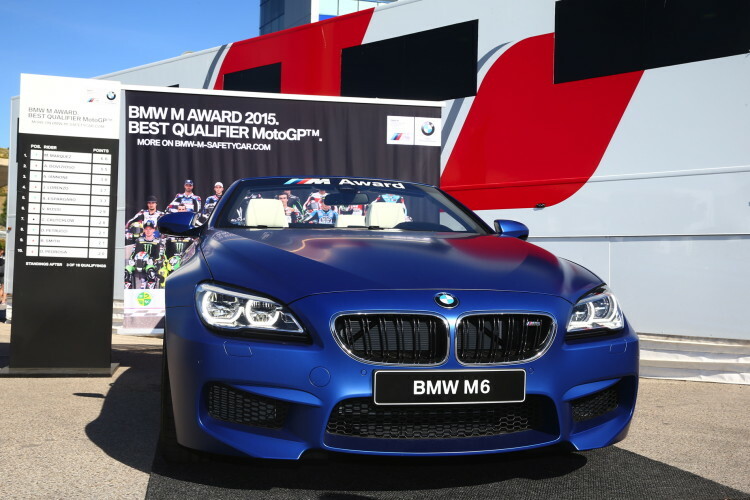 This year too, a very special prize awaits the top MotoGP qualifier: the new BMW M6 Convertible, with individual extras. The exclusive high-performance car was unveiled today in the MotoGP paddock at the Circuito de Jerez. The new BMW M6 line-up allows BMW M Division to restate its leadership in the high-performance luxury segment. The outgoing models had already set new benchmarks with the flawless balance of power, efficiency, agility, comfort and luxury that is typical of M models. And now the latest BMW M6 models, including the new BMW M6 Convertible, are is poised to write a fresh chapter in this success story, fuelled by an even more finely honed, well-resolved overall concept. Aboard the new BMW M6 Convertible, the driver experiences the perfect symbiosis of stunning performance and a refined convertible. The power comes courtesy of the 560-hp M TwinPower Turbo V8 petrol engine (combined fuel consumption: 10.3 l/100 km; combined CO2 emissions: 239 g/km). The BMW M6 Convertible accelerates from 0 to 100 km/ in an impressive 4.3 seconds and boasts a top speed of (regulated) 250 km/h. Technology characteristic of BMW M, such as the double-clutch transmission with Drivelogic, Dynamic Damper Control, and Active M Differential, guarantee sporty and perfect handling in any situation. The new BMW M6 Convertible for this year’s BMW M Award winner is also visually stunning. In its exclusive BMW Individual paint finish “Frozen Blue Metallic”, the convertible looks both ultra-dynamic and extremely elegant. This imposing appearance is reinforced by the Double-spoke style 20-inch BMW M light alloy wheels. The interior features BMW Individual full fine-grain Merino leather in “Opal White”, as well as BMW Individual interior trims in “Ash Grain White” real wood. 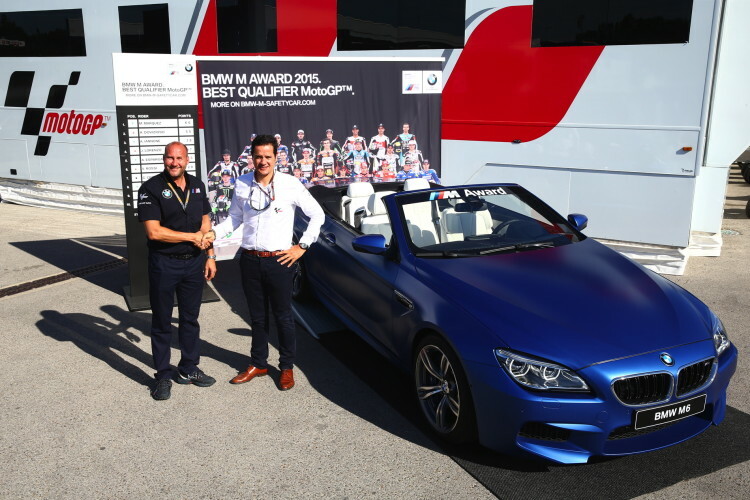 In 2015, the BMW M Award will be presented for the 13th time. Just like the points system for the races, riders at each Grand Prix weekend are awarded points relative to their positions in qualifying. Pole position is rewarded with 25 points, second place on the grid earns 20 points and third place scores 16 points – right down to one point for 15th. The rider with the most points at the end of the season wins the BMW M Award. Valentino Rossi and Casey Stoner are the current record holders, each with three BMW M Awards to their name. In 2013, Marc Marquez was crowned the youngest ever winner of the BMW M Award, and the first rider to receive this award in his first season at the pinnacle of motorcycle racing. In 2014, Márquez won the BMW M Award for a second time. His compatriot Jorge Lorenzo has also earned the coveted title of top qualifier twice so far. Sete Gibernau and Nicky Hayden have both won the BMW M Award once. The BMW M Award is one of the many pillars of BMW M’s long-term commitment to the pinnacle of motorcycle racing. At the centre of the partnership with Dorna Sports is the provision of the BMW M fleet. 2015 is BMW M’s 17th season as “Official Car of MotoGP”. This year’s fleet of official MotoGP vehicles consists of six BMW M and M Performance models. It is spearheaded by the BMW M4 Coupé Safety Car with innovative water injection technology. The BMW M4 Coupé, the BMW M3 and BMW M6 Gran Coupé are also employed as Safety Cars as well. A BMW M5 is available for the Safety Officer, while the new BMW X5 M and the BMW M550d xDrive Touring are used as Medical Cars. BMW Motorrad also provides two BMW S 1000 RRs as Safety Bikes.